When beauty charm and adventure bundle up together, everything around you naturally looks wonderful. That’s how you feel when you are holding a piece as sophisticated and yet as simple as Movado Series 800 Datron. Pretty ordinary and unsurprising for a company like Movado that in its quest for excellence has earned over 100 patents and over 200 international awards for artistry and innovation in watch design and yet every piece they make comes out extraordinary and breathtakingly surprising, this Series 800 Datron being no exception. 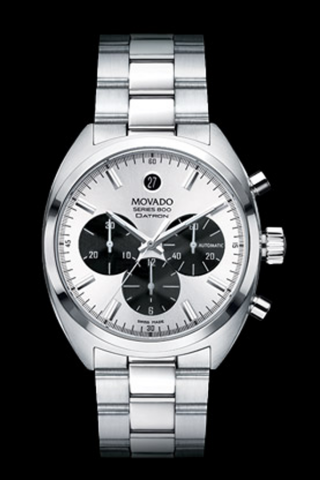 Movado Series 800 Datron’s appearance is striking yet it doesn’t resemble the Movado as we know it. Not in the first glance at least. The quintessential 12 o’clock dot is turned into a calendar and is rather outshined by the 3 gorgeous sub dials in black working beautifully against with the silver dial and the applied markers. Swiss automatic chronograph movement ensures the reliability by each second while Sapphire crystal is to keep it scratch proof and beautiful year on year. The minute and second markers make Datron much more legible than most Movado designs with its minimalist look. It’s strong and masculine looking Movado that Series 800 Datron signifies in both its appearance and charm. One of the must have it piece by Movado.